WA is not the only one celebrating the success of our Men’s Basketball Team. Their accomplishment got the attention of many in our community. Westminster Academy is only the second school to ever win three consecutive state championships in Broward County. Therefore, Commissioner Lamar Fisher wrote a proclamation. 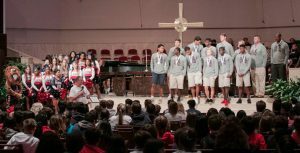 He designated Wednesday, March 27, 2019, as “Westminster Academy Men’s Varsity Basketball Team Day” in Broward County. We celebrated the official day in the upper school chapel. Many wore their new 3‐Peat t‐shirts. The school heard from Commissioner Lamar Fisher in a video, which you can watch here. Then, the team received the framed proclamation. Finally, the lower school formed a tunnel from the sanctuary to their bus. The team, adorned with their newest medal, received cheers and high‐fives from our little lions on their way out. Even our proud WA alumni and alumni parents joined in the celebration. They treated the team with a special off‐campus lunch. To see pictures of the festive day, please visit our Facebook Page.